Based on the economic and social development needs of Ningbo and compliance with the development orientation of industries in Ningbo, to preferably support high-end entrepreneurial talents and teams from home and abroad that expected to upgrade the industrial level, lead the industrial development and bring significant economic and social benefits. Focus on the introduction of “246” modern industrial clusters and “3511” advanced manufacturing industrial projects, which mainly consist of the three strategic industries of new material, high-end equipment and new generation information technology, the five advantageous industries of green petro chemical, clean energy, automobile, textile and garment and home appliances, a group of emerging industries of biological medicine, marine high technology and energy conservation & environment protection, as well as a batch of talents and teams from related fields of key subdivided trade structures such as rare earth magnetic materials, high-end metal alloy materials, grapheme, specialized equipment, key basic parts, optical electron, integrated circuit and industrial Internet of Things. The innovative team shall have 1 team leader and at least 4 members (excluding the counselor), work or have not worked in Ningbo after Jan. 1st, 2017; the team leader shall be no more than 55 years old (born later than Jan. 1st, 1964, hereinafter inclusive) and normally the members shall be no more than 45 years old (born later than Jan. 1st 1974). The innovative team leader shall have a doctor’s degree and has taken positions equivalent to a professor in famous domestic and overseas colleges or scientific research institutions, or shall have had an intermediate or senior post in domestic or overseas well-known enterprises or institutions for over three years; at least 2 of the team members shall have obtained a doctor’s degree from foreign (overseas) colleges, and the rest shall have obtained a master’s degree or higher; at least 3 members shall have more than 2 years’ stable cooperation with the team leader in academic and scientific research before then; the leader and the core members of the innovative team shall take a full-time job in Ningbo after the introduction with the working period no less than 9 months for each year and the continuous working time no less than 5 years. The innovative team should master core technology, which should reach the world-leading or domestic advanced level, or fill the technology gap in the domestic research field and significantly promote the technological innovation for relevant industrial fields. The supporting organization of the innovative team should be in good running condition with sound technology innovation system, complete supporting measures, strong innovation capability and dominant position in the industry. For the enterprise that the innovative team is relying on, it should featuring good business performance, being capable of providing necessary scientific research fund and R&D equipment for the innovative team, as well as various required elements for the realization of project industrialization. The entrepreneurial team shall have 1 team leader and at least 4 members (excluding the counselor), start or have not started business in Ningbo after Jan. 1st, 2017; normally the team leader shall be no more than 60 years old (born later than Jan. 1st, 1959, hereinafter inclusive) and the members shall be no more than 50 years old (born later than Jan. 1st 1969). The entrepreneurial team leader normally shall have a doctor’s degree and has taken positions equivalent to a professor in famous domestic and overseas colleges or scientific research institutions, or shall have experience in an intermediate or senior technical management position in transnational corporations or well-known enterprises for over three years with prominent research achievements or achievement transformation results. The members of the entrepreneurial team shall normally have obtained a master’s degree or higher, and at least 3 of whom shall have more than 2 years’ stable cooperation with the team leader in project problem tackling and product research before then. The entrepreneurial team should have proprietary intellectual property rights for the mastered core technology, which should reach the world-leading or domestic advanced level, or fill the technology gap in the domestic research field, show great market prospect and can realize the industrialization production. The innovative talent shall normally have a doctor’s degree from a foreign (overseas) college and shall have held an intermediate or senior professional and technical position in foreign (overseas) well-known colleges or scientific research institutions, or management or technical position in foreign (overseas) well-known enterprises or institutions for more than 2 years with the age no more than 55 years old. Among which, if the young talent introduced from such college or institution is not older than 40 (born after Jan. 1st, 1979) and has worked overseas for more than 3 years, certain flexible policies can be applied on the overseas position or title requirements. The innovative talent should have proprietary intellectual property rights for the mastered core technology, which should reach the domestic advanced level, or fill the technology gap in the research field of Ningbo and promote the technological innovation for relevant industrial fields. The supporting organization of the innovative talent should be in good running condition with sound technology innovation system, complete supporting measures, strong innovation capability and dominant position in the industry. For the enterprise that the innovative talents is relying on, it should featuring good business performance, being capable of providing necessary scientific research fund and R&D equipment for the innovative talents. The innovative talent shall come to work (serve) in Ningbo after Jan. 1st, 2018 and work in the relying organization before Mar. 15th , 2019, or sign the preliminary contract with the relying organization and come to the position within half a year. The full-time working period shall be no less than 9 months for each year and the continuous working time shall be no less than 5 years. The main founder, the first majority shareholder or the largest natural person shareholder of a company shall not apply for the innovative talent category. The entrepreneurial talent shall normally have a master’s degree or higher from a foreign (overseas) college and shall have had an intermediate or senior professional and technical posts in foreign (overseas) well-known colleges or scientific research institutions, or intermediate or senior management or technical position in foreign (overseas) well-known enterprises or institutions with the age no more than 60 years old. The entrepreneurial talent should have proprietary intellectual property rights for the mastered core technology, which should reach the domestic advanced level, or fill the technology gap in the research field of Ningbo, show great market prospect and can realize the industrialization production. The entrepreneurial talent (natural person) should be the major founder and the first majority shareholder of the enterprise, which featuring the actual paid-in monetary contribution no less than 1 million Yuan; the monetary contribution of the entrepreneurial talent shall not be less than 1 million Yuan. The entrepreneurial talent shall come to work (serve) in Ningbo after Jan. 1st, 2014 and establish an enterprise in Ningbo with complete business registration procedures before Mar. 15th , 2019. There can only be one applicant for one enterprise.Among the applications of the above-mentioned talents (teams), for those superior excellent entrepreneurial and innovative talents (teams), one exception can be made in terms of age, education background, post or title; for the entrepreneurial and innovative teams led by the top and superior excellent talents, including the winners of international awards such as the Nobel prize, the Turing Award and the Fields medal, selected persons equal to academicians of the CAS and CAE that from countries such as America, UK, Canada and Australia, as well as presidents and vice presidents of world-known universities, appropriate exceptions can be made in terms of age, education background, post, title, time of settlement for the leader and the members. Filling in Application Materials. From Jan. 1st to Mar. 15th, 2019, the qualified applicants can log in the “Online Application System of Ningbo ‘3315 Plan'” within the allotted time to fill in the application form as required and upload the related appurtenant materials. Late applications will not be accepted. For the application of innovative team and innovative talent, the review opinions, recommended reasons and supporting policies from the relying unit shall also be submitted.The application would be accepted under separate unit. Select in the system according to the following regulations: for the innovative talents (teams) in colleges in Ningbo, select the Municipal Education Bureau; for the innovative talents (teams) in province-ministry and municipal scientific research institutions, select the Municipal Science and Technology Bureau; for the entrepreneurial talents (teams) and other innovative talents (teams), select the Municipal Human Resource and Social Security Bureau; and for the foreign-born innovative talents, select the Municipal Foreign Experts Bureau. Qualification Review. The qualification review will be carried out by relevant units by level-to-level and layer-to-layer in March, 2019. Expert review. Form April to July, 2019, the expert review panel grouped by the corresponding professional scientists, risk investment experts and other industrial experts will be invited to perform the written review and defense review. Authenticity review on intellectual property and academic achievements. The authenticity review on intellectual property and academic achievements will be carried out on the programs that pass the qualification recheck in July, 2019. Due diligence. In August, 2019, due diligence will be performed upon the entrepreneurial and innovative teams and programs recommended by experts of defense review. Approval and issuance. In September, 2019, according to the recommendation suggestions of the experts and the results of the due diligence, combining with the actual situation of the industries in Ningbo, the document shall be approved and issued according to relevant procedures.IV. Supporting Policies1. Project funding. For the selected entrepreneurial and innovative teams of “3315 Plan”, an entrepreneurial and innovative subsidy of maximum 20 million Yuan, 10 million Yuan and 5 million Yuan will be respectively granted as per the three level of Category A, Category B and Category C. For the high-end entrepreneurial and innovative teams led by top talents in the world, “one project one discussion” policy will be implemented with an entrepreneurial and innovative subsidy of maximum 100 million Yuan. For the selected entrepreneurial and innovative talents of “3315 Plan”, a subsidy of 1 million Yuan will be granted. 2. Supporting subsidy. 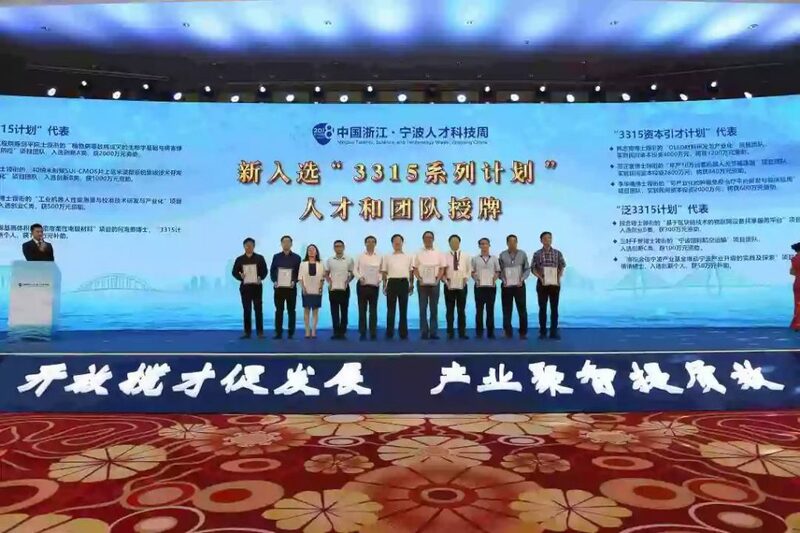 For the selected team leader and core members listed into the national or provincial key talent plan via Ningbo, a maximum reward of 6 million Yuan will be granted; those selected into the provincial leading innovative and entrepreneurial teams will be granted with a subsidy of 5 million Yuan. 3. Talent level upgrading awards. For the selected team leader and member developing into top talents of the Classified Catalogue for Talents in Ningbo upon independent cultivation and upgrading, a maximum reward of 8 million Yuan will be granted to the talents each and 5 million Yuan to the cultivation unit for once respectively; and for the selected applying for excellent talents (excluding those selected into the national key talent plan), a maximum reward of 5 million Yuan will be granted to the talents each for once; and for leading talents (excluding those selected into the key talent plan of Zhejiang Province), 100,000 Yuan will be granted for once. 4. Financing support. Based on the development situation of the selected project enterprise, preferentially recommend to be listed in Ningbo Equity Exchange Center and follow-up invested by the municipal HaiBang Fund, CaiFu Fund, Angel Fund, Venture Capital Guiding Fund and others with a maximum loan on credit as 20 million Yuan granted by relevant commercial bank and enjoy the market-oriented entrepreneurial services provided by the institutions concerned. 5. Enterprise development grants. For the selected project enterprises achieving rapid development and growth within 5 years since the establishment and great contribution to Ningbo’s economic and social development, a maximum grant of 5 million Yuan will be provided based on the operation revenue and other indicators upon affirmation. 6. House-purchasing subsidies. A subsidy of 0.3 million Yuan will be granted to the selected team leader who purchases a house in Ningbo. For those having enjoyed the policies such as municipal and county-level settling-in subsidy, housing subsidy or housing allocation in kind, the house-purchasing subsidy will be granted as per the amount which is higher or filling the difference with no duplication. For the selected talents and teams of “3315 Plan”, those meeting relevant conditions can also enjoy related policies stipulated in regulations such as the “Several Opinions on Accelerating Promotion of the Intelligence Gathering of Open Talents-attracting Industries” (Y.D.F. No. 42) and “Opinions on the Deepening Implementation of Introduction of Overseas High-level Talents and High-end Entrepreneurial and Innovative Teams of ‘3315 Plan'” (Y.D.B. No. 48), as well as supporting subsidy policies of the place settled. Deadline for the application of 2019 “3315 Plan” is Mar. 15th and any applications overdue will not be included into the selection of this year. All of the talents and team leaders or members, who have been selected into Ningbo “3315 Plan”, “3315 Investment and Talents Introduction Plan” or “Massive 3315 Plan” (hereinafter referred to as “3315 Series Plan”), enjoyed the related policies of Implementation Measures for Accelerating Agglomeration of Top Talents of Ningbo (Trial) and designated by the superior competent departments to take major leadership positions of the ministerial, provincial and municipal departments in Ningbo, as well as the related talents and teams directly introduced by “One Project, One Discussion” strategy of Ningbo, shall not apply for 2019 “3315 Plan”. The applicant (including the team leader and the members) can only choose one category for application. Meanwhile, the applicant shall undertake the careful application contents and sign in the commitment column of the application report. After the application is selected after review, the team members shall not be reduced or replaced arbitrarily. Do no adjust the registered capital, project content or project objective arbitrarily. After the talents (teams) that selected into the “3315 Plan” are settled in Ningbo, they shall not apply the same type program in other places. The enterprise established by the talents (team) should undertake that it will not move away from Ningbo within the 10 years after obtaining the funding. In case of any false information filled and submitted, the applicants will be disqualified and blacklisted, and will have no right to apply the “3315 Series Plan” in future. All of those who have been selected will be disqualified for the application of the “3315 Plan” talent (team). For those constituted as illegality, relevant persons shall be investigated and affixed legal liabilities. No state secret shall be involved in the submitted material. The secret-associated materials shall be submitted separately according to relevant security stipulations of the state if they are required indeed, which should be attached with the security classification document from the employer of the applicant. Top secret materials shall not be submitted. The Leadership Office of Experts Work of CPC Ningbo Committee reserves the right of interpretation for this Notice.Tel: 0086-574-89186470; E-mail: zzbrgc@163.com.